It’s often said that fertile areas for innovation lie at the border of two or more disciplines. So it’s encouraging that the area of Interdisciplinary Research (IDR) is now formally recognized and is being actively promoted through projects and funding (see eg here). Here lies the burgeoning world of interdisciplinary research: This is where two or more disciplines combine to create something more than the sum of their parts. It is about not being constrained by one way of thinking or tackling a problem. Instead, skills and knowledge are gained in a variety of disciplines and new applications for the research are sought. In short, it is the home of blue-sky thinking. Take the challenge of climate change. “There’s the fundamental science – the physics, the chemistry and so on,” says Scott, “but there’s also the social science: how do we get people to change their behaviour? And the engineering aspects: how do we design more efficient power generation systems, and improve insulating technologies?” Having experts from many disciplines grouped into themes means that the challenges can be attacked from all sides simultaneously, making the process much more integrated and efficient than working in groups divided by subject. Other ‘grand challenge’ areas where IDR may play an important role are quantum information processing, bioinformatics, the epidemiology of AIDS and sustainable development. Apart from these major areas, IDR may also be useful in stimulating innovation in and between large commercial organisations. This will also help with galvanising knowledge silos and countering the ‘curse of knowledge’. How can we better understand this fuzzy overlap activity? 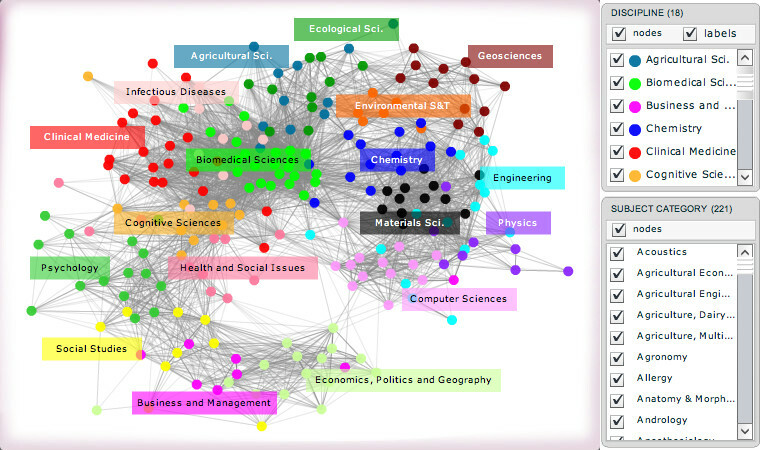 One group has produced visualisations of the ‘degree of interdisciplinarity’ based on an analysis of cross-citations from a set of publications. Two sample diagrams are given above and below. Interdisciplinary research (“IDR”) is often trumpeted as essential for scientific and technological advancement. 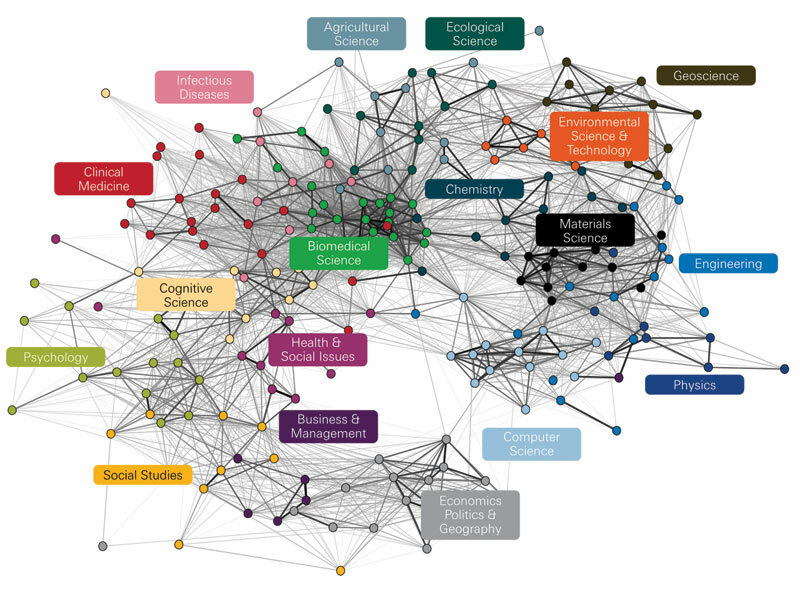 However, interdisciplinarity is an ambiguous and multidimensional concept: there are several legitimate perspectives on how to track it –and a lack of consensus on which are the most appropriate. This entry was posted on Monday, May 23rd, 2011 at 5:22 pm and is filed under Business Management, Knowledge Management, Research & Innovation. You can follow any responses to this entry through the RSS 2.0 feed. You can leave a response, or trackback from your own site.